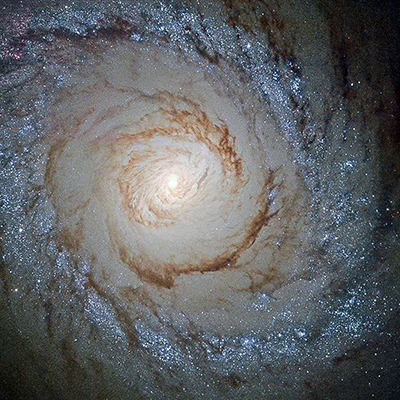 What's happening around the center of this spiral galaxy? Seen in total, NGC 1512 appears to be a barred spiral galaxy -- a type of spiral that has a straight bar of stars across its center. This bar crosses an outer ring, though, a ring not seen as it surrounds the pictured region. Featured in this Hubble Space Telescope image is an inner ring -- one that itself surrounds the nucleus of the spiral. The two rings are connected not only by a bar of bright stars but by dark lanes of dust. Inside of this inner ring, dust continues to spiral right into the very center -- possibly the location of a large black hole. The rings are bright with newly formed stars which may have been triggered by the collision of NGC 1512 with its galactic neighbor, NGC 1510.